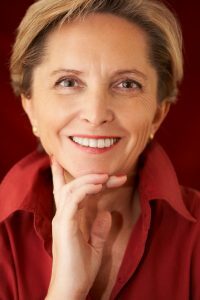 Where are dental implants placed? Dental implants can be placed in either the upper or lower jaws. 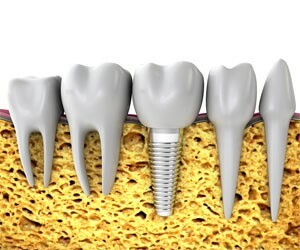 As the implant is made out of materials which are generally well tolerated by the human body (titanium or titanium alloy), a dental implant fuses with the bone to become a good anchor for the replacement tooth. This procedure is not painful because the bone has no nerves and it is done under local anaesthetic or sedation, so you don’t feel a thing. 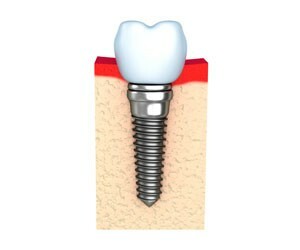 Dental implants can be used to replace single or multiple missing teeth. There are two types of dental implant, single tooth dental replacement or multiple tooth replacement. Implants are the best, most elegant way of replacing missing teeth, closing gaps or turning your removable denture into fixed teeth. 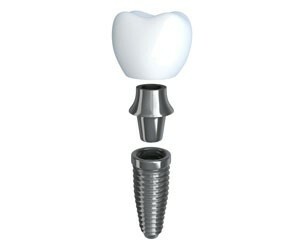 Dental implants offer a number of benefits over bridges and dentures. You treat it, use it and clean it like a natural tooth. You will be able to chew and smile with a full set of functioning teeth. Implant teeth feel and look natural, just like your own. If you keep your gaps, your remaining teeth will start to move and will collapse into the existing gaps. This will affect your bite and can cause gum disease. Your jawbone can shrink without the presence of a root structure of a natural tooth. This shrinkage will make your face look older than it is. This is also why we apply socket preservation to preserve the VOLUME of the jawbone. Statistics confirms a success rate of 95% over 20 years for individual implants and even higher success rates for the bridges they support. There is over 3 decades of clinical experience relating to implants with over a million patients treated.